After watching snowflakes fly yesterday, I'm more inclined to say winter, rather than fall, is in the air. Inside my house it feels and looks like fall though, especially with the addition of this new wreath. My hubby put his mad woodworking (and painting) skills to work, cutting each of the petals and assembling them onto a frame. 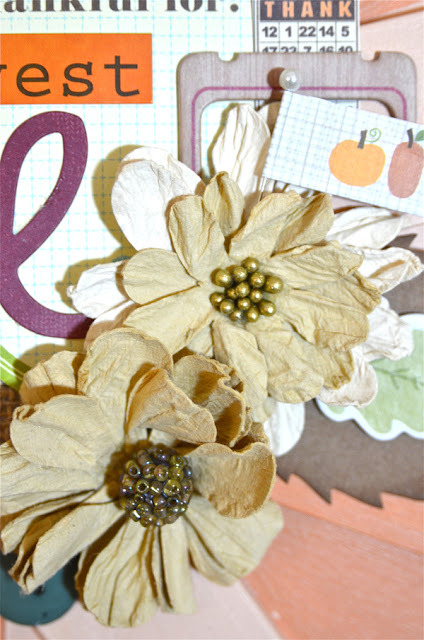 He created the burlap center, using a scrap left over from this burlap monogram project. The Bo Bunny flowers are leftovers from this layout. I also used a bunch of buttons to cover the gap between the burlap and wood. Can't say I put a big dent in my stash, but some. A bit of layering going on behind the flowers. Thanks for stopping by today! I'll be back tomorrow with a new layout. This is so fun Lisa...how great is it to have a hubby you can share a hobby with!!!! ooooo your dh has mad skills. love the wreath. You have the best DH!! This is so cute, Lisa! This is so great!!! I love the colors and the way you did the center. I particularly like the button border. Great use of buttons. TFS! what a beautiful wreath!!! 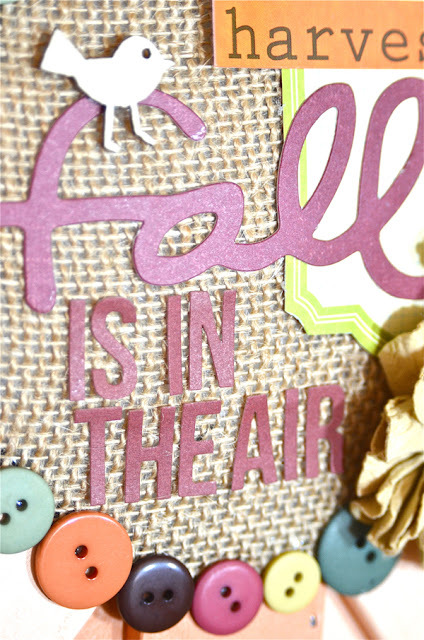 love that your hubby is crafty! Very creative and what a good way to use up some buttons. so cute and festive!! love those flowers!! Love it! So bright and festive! Thanks for sharing! 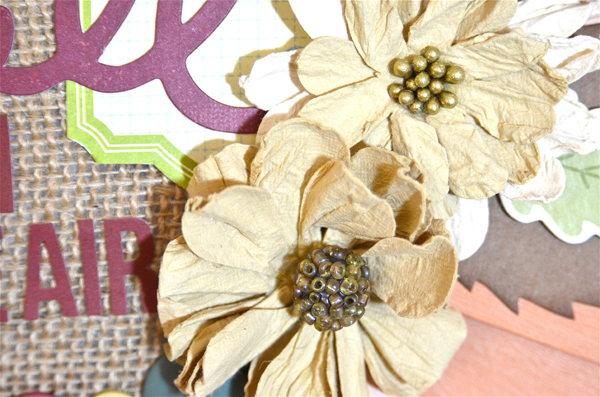 Love the circle of buttons on your wreath! Very pretty! We have had a few days feel more like winter than Fall already. But yesterday was beautiful here. Hope we have more days like that! Your wreath is absolutely gorgeous! Awesome job and so clever! Love your wreath. So clever. so cute! i can't believe your dh cut those petals! Wow wow wow!!!! This is gorgeous! I loveeeeeeeeeee the burlap and the flowers!!! Fun and creative! Love the colours! Your husband is the best!! And this came out adorable!! 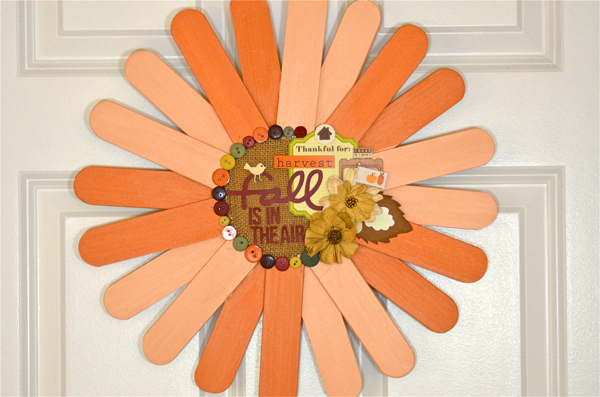 Such a fun Fall wreath, Lisa!! Love the two different color Oranges on the wood pieces! Gorgeous. I love all the texture with the wood and the burlap, flowers. Very nice! You've got one crafty family! Beautiful and creative. Love this.